A 35-story luxury tower in the heart of Minneapolis, Marquette Place is a residential community focused on service and quality, at walking distance from all the job hubs of downtown Minneapolis. Marquette Place is connected through its own skyway to Minneapolis’ skyway system. This is a network of indoor heated walkways, with cafes, shops and restaurants, which connects every part of the downtown business district. In the winter, you can step directly from Marquette Place into the skyway system and reach your downtown destination without going outdoors. At Marquette Place you will find furnished urban homes of uncompromising quality and a host of services and amenities for a life of comfort and undisturbed peace in the midst of a vibrant metropolitan area. The Convention Center is across the street; the Minnesota Orchestra is a block away. A short stroll along Nicollet Mall leads to gourmet restaurants, cheery pubs, glittering nightspots, performing arts, sporting events, and more. We will assure that you will find your ideal “home-away-from-home”. The undisturbed peace, comfort and services provided around-the-clock, seven days a week, by our solicitous, experienced staff will contribute to the enjoyment of your home-away-from-home, and will give you a most pleasant living experience in the Twin Cities. At Marquette Place you will find a complete solution to your temporary housing needs. A wide selection of floor plans and custom features will assure that you will find your ideal “home-away-from-home”. Floor-to- ceiling windows, warm woodwork, gourmet kitchens with granite countertops and stainless steel appliances, fireplaces, spacious balconies with spectacular views, individual security system, ceramic tile bathrooms and high-speed internet are standard amenities in each home. Luxury furniture, including leather couches, designer pieces and top-of-the-line mattresses; and rich furnishings—such as high thread count sheets, thick bathroom towels and robes—will all help in making your stay as pleasant and comfortable as can be. The spectacular 35th floor Party Room is perfect for parties or business events. Also, your overnight guests can stay in our fully appointed visitors’ suites for a nominal charge. Parking for one car is provided in our attached heated garage. Additional parking is available upon request. Ample guest parking is available for your visitors. Around-the-clock doorman service, video monitoring throughout the common areas and electronically controlled access to the building and to the parking garage will all contribute to the comfort of your home. Prompt, courteous and competent service is the cornerstone of our management philosophy. Together with an experienced team of management professionals, our concierge, housekeeping and maintenance staff are always available to assist you and make your life at Marquette Place as pleasant as it can be. Ease into your day with our wake-up service and a complimentary full size continental breakfast. Find the groceries you ordered delivered to your apartment by our housekeeping personnel. Our concierge staff are on hand 24 hours a day, seven days a week to make your life as carefree and enjoyable as possible. 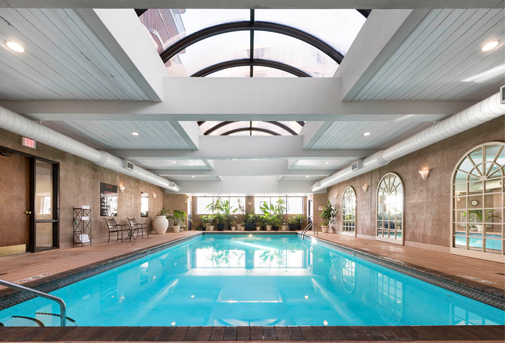 The ”spa” lifestyle at Marquette Place will satisfy your active and engaged life. 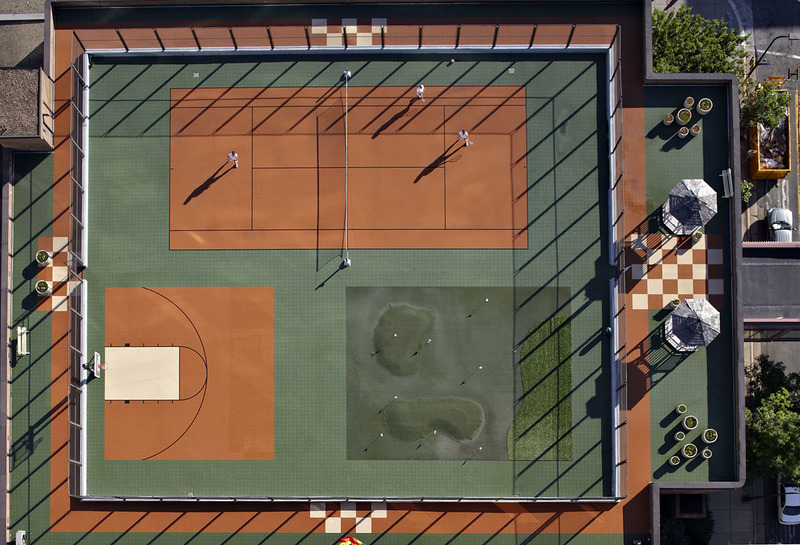 You will enjoy a top-of-the-line fitness center, a large heated swimming pool and spa, three saunas, sun decks, tennis and sport courts, a nine-hole putting green, a private outdoor jogging track, lounges, and more.